Yemen’s Ambassador to Beirut Abdullah Adoais met on Thursday with Lebanese Minister of Interior Rya al-Hassan. 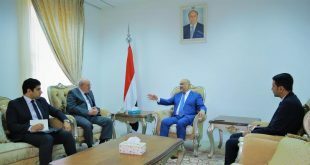 Yemeni-Lebanese bilateral ties and cooperation in the field of Security were key of focus of conversations. Addoais briefed al-Hassan on the situations in Yemen and the ongoing conflict triggered by Houthi rebel militia’s coup against an official authority, launching warfare on different governorates. The Lebanese Minister stated that her country is keen on boosting cooperation between the two countries, promising to cooperate with the Yemeni embassy to tackle the troubles facing the Yemeni nationals in Lebanon.